I was thinking today that I haven't taken any pics of my belly in a couple of weeks so I asked Jared to take a few because I won't have it much longer. 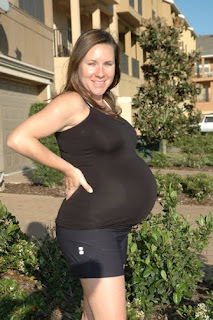 I am 39 weeks and when I went to the Dr. today I was 4 cm dilated and 70 percent effaced. This girl will be here before we know it! I just wanted to do a quick update. I will be taking some pics of her nursery to post here soon just haven't gotten to it. :) I am so tired! Jen, I honestly think that you are the cutest pregnant woman I've ever seen. :) Can't wait til she's here! Congrats again!! !